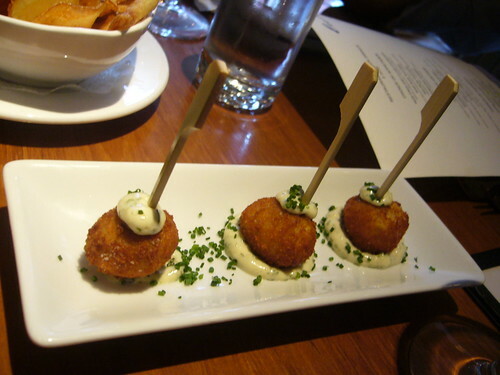 Lure was the second experience of Restaurant Week 2008 and a true treat. I went with my old tennis teammate Joming and her friend Scott Yang Monday night for dinner to this subterranean seafood restaurant in Soho near Dean and Deluca. Let me first say that the decor inside is amazing – it looks like the inside of a yacht which makes sense. Clean lines, wood panels, leather booths, lots of blue. For appetizers, Joming ordered the raw bar, I had the shrimp tempura, and Scott got the salmon tartare – a good spread. 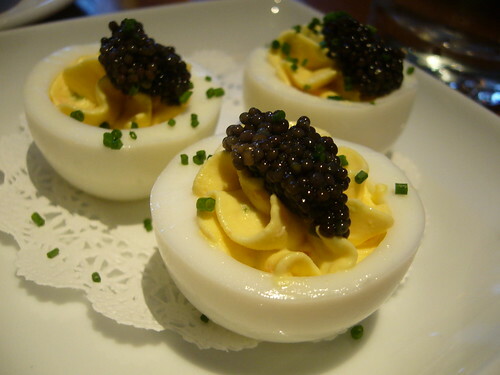 We were also surprised with two amuse-bouches, crab cakes on a stick and eggs on eggs (caviar topped deviled eggs) and an introduction to the executive chef himself, Josh Capon. A really nice touch if you ask me. First: my tempura was AMAZING. I’ve never had shrimp that succulent and the outside crust wasn’t soggy at all, which is usually one of my biggest fears. The spicy mayo sauce had quite a lot of zing and reminded me of the sauce that comes with volcano rolls at Fujiyama Mama (a favorite local sushi place in Westfield). My mouth was so darned happy. And the portion wasn’t teeny tiny either which just meant more shrimp for me! I didn’t get to try the tartare or the rawtasting, but therewas sound approval from both Joming and Scott, so I’m going to go with their statements and say they were both delicious as well. Main courses: Joming and Scott had the nori crusted tuna and I went with a perfectly cooked and delicate (rare in my books) grilled salmon. My favorite part of this dish though was the lemon gnocchi underneath, which had the perfect smooth texture and a unique twist in taste from the citrus. This is something I want to try making the next time I get in the kitchen. It just added a whole another aspect to your regular gnocchi pasta. Yum. 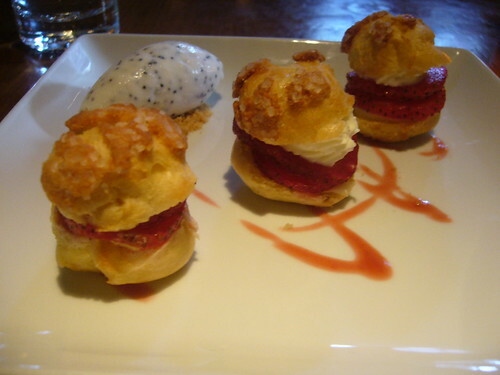 Dessert started with another treat from the chef – strawberry creampuffs with a sour-cream poppyseed gelato. Joming couldn’t get her spoon away from the gelato, she just kept spooning away little by little (she though she was being subtle) until there was none left. I loved the creampuffs! They weren’t heavy at all and wonderfully buttery/flaky, but the strawberries cut the richness of the pastry. There was also a lemon meringue bar, which would’ve been too sweet if there weren’t also the tart blueberries on the side. The sake mojito sorbet was…different. It took a bit to get used to the intriguing taste, but I came to like it by the last couple of bites. Very refreshing. 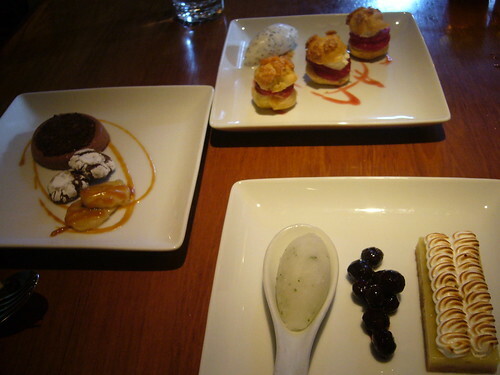 Joming had decided to get the chocolate panna cotta, which I liked. Creamy, silky, smooth…a little bit of bitterness that mellowed out. I wanted more though. The cookie and banana in caramel sauce I didn’t care much for. All in all, a wonderful meal, no doubt enhanced by the additional bites. I’d love to try Lure’s sushi next time and the raw bar since that’s mainly what the restaurant is known for. Given that it’s passed my initial tasting with flying colors, I’m now definitely more willing to shell out (haha! or not) money for a couple of special rolls and oysters. And now, I’m hungry again! Coming up…BARBECUE! I was wondering what Lure Fishbar was from the headline. Everything looks so delicious. I’m drooling over that lemon meringue. Wow. drool. drool. drool.i haven’t had dinner yet and i’m starving. coming to your blog was a very, very bad idea. 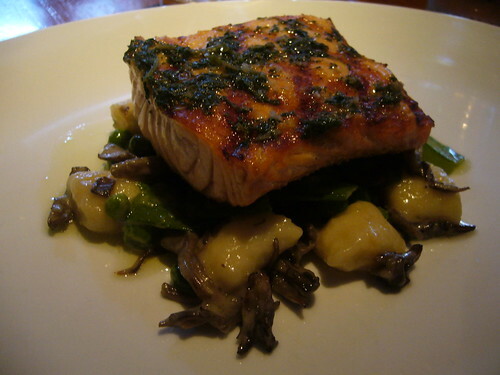 You are currently reading RW – Lure Fishbar at Notes on Food.